In February 2016, the school was awarded a grant from the Lottery, Awards for All funding and our Tree House was installed. The addition of the Tree House will enhance our outdoor learning and play environment, providing further opportunities for all our children to learn outdoors. Over time, our School Council have explored various ways to improve our outdoor environment. They eventually settled on the idea of a Tree House, as an outdoor learning base, over 4 years ago. As part of the development of this project, our School Council discussed possible designs and then took ideas to the class councils (individual classes across the school) who then discussed how this could be used. Since then, a simple design was developed, based on initial drawings and images collated by the School Council. It was then posted on to the school website and signposted to parents and the wider school community. 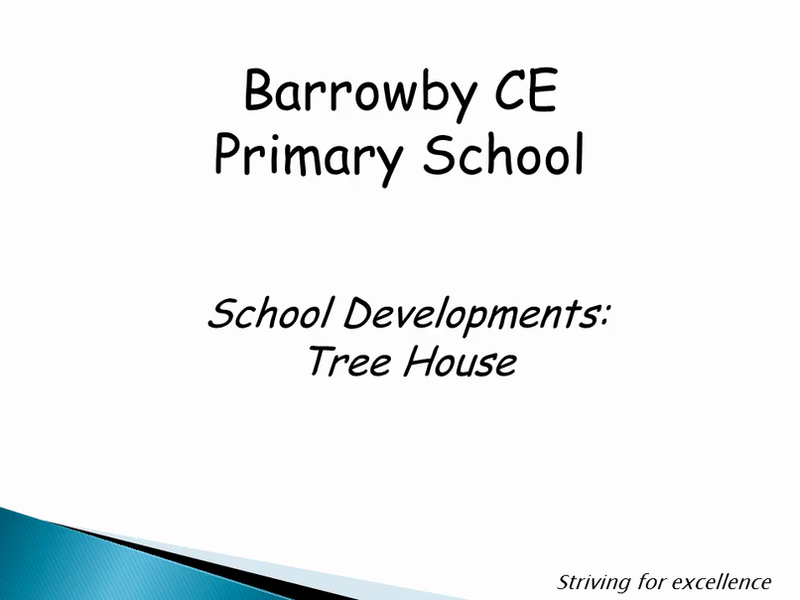 In April 2015, the Tree House and its impact was discussed, with the Full Governing Body and it received unanimous support. The initial design was reworked and costed accordingly. Various illustrations and images were presented to the school community, during last year's Summer Fair (July 2015) and opinions sought from the school community. We feel it is important to enable our children to use the outdoor environment as a context for learning and play. We also believe that children learn best from first hand experience, both within and outside of the classroom and we prize our rural environment, as a rich resource to be used to the full. Our newly installed Tree House will continue to enable all our pupils to fully engage with 'outdoor learning' and will act as an, outdoor classroom, a base for exciting outdoor learning. Our new Tree-House is beginning to settle in to its surroundings. Our contractors have dug the foundations for the new path which is going to link the playground to the Tree House, so that it can be used all year round.